This essay examines quantifiable and hopefully non-contentious aspects of the question. The temperature-increasing capacity of atmospheric CO2 is known and widely accepted to diminish as its concentration increases. Global warming advocates and climate change skeptics both agree on this. IPCC published reports acknowledge that the effective temperature increase caused by growing concentrations of CO2 in the atmosphere radically diminishes with increasing concentrations. This information has been presented in the IPCC reports, yet it is well disguised for any lay reader, (TAR3, Chapter 6. Radiative Forcing of Climate Change: section 6.3.4 Total Well-Mixed Greenhouse Gas Forcing Estimate) . It is not acknowledged in their Summary For Policymakers. Figure 1: Logarithmic warming diminution of CO2. The rapid diminution effect is an inconvenient fact for global warming advocates, nonetheless it is well understood within the climate science community, but it is certainly not much discussed. This logarithmic diminution effect is probably the reason why there was no runaway greenhouse warming caused by CO2 in earlier eons when CO2 levels were known to be at levels of several thousands ppmv. – Up to 200 ppmv, the equivalent to about 82% of the temperature increasing effectiveness of CO2, is essential to sustain photosynthesis in plant life and thus the viability of all life on earth. – A further 100 ppmv was the level prior to any industrialisation, this atmospheric CO2 made the survival of the biosphere possible. It was responsible for a further 5% of the CO2 greenhouse effect. – Following that, a further 100 ppmv, (certainly man-made in part), adding 4.1% of the CO2 effectiveness brings to the current level 400 ppmv. – CO2 at 400 pmmv is already committed and immutable. So CO2 has already reached about 90+% of its potential warming effect in the atmosphere. Figure 2: Temperature as a function of Co2 concentration. A comparison between all four estimates are set out below in the context of the whole approx. 33°C greenhouse effect. This graphic shows the remaining temperature effect of CO2 in orange that could be affected by global decarbonisation policies. It is anachronistic that some of the IPCC data sets shows very large proportions of the temperature effect attributable to CO2. The concomitant effect of those higher levels of CO2 warming is that the proportion of the total approx. 33°C then attributable the water vapour and clouds in the atmosphere is reduced so as to be unrealistically low. Is it plausible that CO2, a minor trace gas in the atmosphere, currently at the level of ~400 ppm (0.04%) achieves such radical control of global temperature when compared to the substantial and powerful Greenhouse Effect of water vapour and clouds in the atmosphere? Global warming advocates stipulate that all increases in the concentration of CO2 are solely man-made. This is not necessarily the case, as the biosphere and slightly warming oceans will outgas CO2. The man-made CO2 contribution at maximum is only a minor part of the CO2 transport within the atmosphere, at ~3% of the total [i]. The recent IPCC report now admits that probably increasing CO2 levels are only approx. 50% man-made. There are the clearly divergent views of the amount of warming that can result from additional CO2 in future, but even in a worst case scenario whatever change that may happen in future can only ever have a marginal effect on global temperature. So any de-carbonization policy, however widely applied, trying to control CO2 emissions can only ever achieve a minor future temperature reduction. Whatever political efforts are made to de-carbonize economies or to reduce man-made CO2 emissions, (and to be effective at temperature control those efforts would have to be universal and worldwide), those efforts can only now affect at most ~10-11% of the future warming potential of CO2. So increasing CO2 in the atmosphere can not now inevitably lead directly to much more warming. Increased CO2 levels in the atmosphere cannot give rise to any dangerous temperature increase. Decarbonization policies could never have any useful impact to realistically control any rising world temperatures and the future world climate. As the future temperature effect of increasing CO2 emissions is now so minor, there is no possibility of ever attaining the much vaunted political target of less than +2.0°C by the control of CO2 emissions. It is likely that any current global warming is largely a natural process, is within normal limits and is probably beneficial. The probability is that any current global warming is not man-made and, in any case, it could be not be influenced by any remedial action, however drastic, taken by a minority of nations. In a rational world, that prospect should be greeted with unmitigated joy. All concern over CO2 as a man-made pollutant can be entirely discounted. It is not essential to disrupt the western world’s economy. The cost to the European economy alone is considered to be approx. £165 billion per annum until the end of the century, not including the diversion of employment and industries to elsewhere. This deliberate economic self harm can be avoided and the vast resources could be spent on much more worthwhile endeavours. If warming is happening, it provides a more benign climate for the biosphere and mankind. Any extra CO2 has already increased the fertility of all plant life on the planet. If warming is occurring at all, a warmer climate within natural variation would provide a future of greater opportunity and prosperity for human development, especially so for the third world. To quantify what may be achieved by political action for de-carbonization by Western economies, this comparative table below shows the remaining effectiveness of each 100 ppm increment up to 1000 ppmv, with the total global warming in each of the four diminution assessments. Figure 4: Little impact for trillions of dollars in cost. 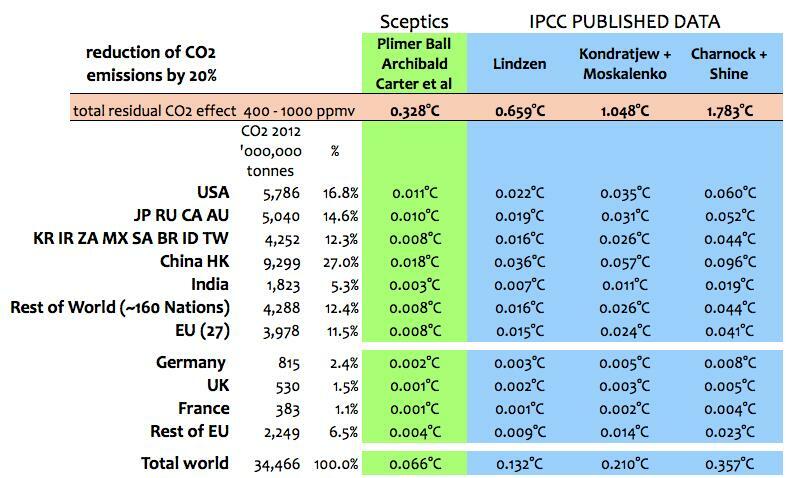 The table below shows the likely range of warming arising from these divergent (sceptical and IPCC) views, (without feedbacks), that would be averted with an increase of CO2 for the full increase from 400 ppm to 1000 ppm. This table assumes that the amount of CO2 released by each of the world’s nations or regions is reduced universally by some 20%: this is a radical reduction level but conceivable. Figure 5: Temperature reduction by nations, regions. The results above for countries and country groups show a range for whichever scenario of only a matter of a few thousandths to a few hundredths of a degree centigrade. However it is extremely unlikely that the developing world is going to submit to non-development on the grounds of reducing CO2 emissions. So it is very likely that the developing world’s CO2 emissions are going to escalate no matter what is undertaken by developed nations. These figures show that whatever the developing world does in terms of increasing CO2 emissions, the outcome is likely to be non-beneficial. The changing global temperature patterns, the current pause and probable impending cooling. The rapidly growing CO2 emissions from the bulk of the world’s most populous nations as they continue their development. The diminishing impact of any extra CO2 emissions on any temperature increase. Normal daily temperature variations at any a single location range from 10°C to 20°C. Normal annual variations value can be as much as 40°C to 50°C. Europe as a whole only accounts for approx. 11% of world CO2 emissions. The UK itself is now only about approx. 1.5% of world CO2 emissions. As the margin of error for temperature measurements is about 1.0°C, the miniscule temperature effects shown above arise from the extreme economic efforts of those participating nations attempting to control their CO2 emissions. Thus the outcomes in terms of controlling temperature can only be marginal, difficult to detect and thus irrelevant. The committed nations by their actions alone, whatever the costs they have incurred themselves, may only have virtually an undetectable reduction on world temperature. So it is clear that all the minor but extremely expensive attempts to limit CO2 emissions undertaken by a few convinced western nations will in the end be inconsequential. Truly toxic environmental pollution, (whatever is asserted CO2 is neither toxic nor a pollutant). Rain forest clearance, especially for the production of biofuels [iii][iv]. Biosphere destructive industrial farming at all levels. Wild habitat destruction throughout the biosphere. Many green and renewable energy activities actually detrimental to the environment, etc. The world indeed should be strenuously finding ways to improve these situations. But the unwarranted concentration on reducing CO2 emissions has deflected even well-meaning green activists and green-indoctrinated politicians from these more immediate and more worthwhile objectives. As global temperatures have already been showing stagnation or cooling [v] over the last seventeen years, the world should fear the real and detrimental effects of global cooling [vi] rather than being hysterical about limited, beneficial or now non-existent warming [vii]. It is clear that all the minor but extremely expensive attempts by the few convinced western nations at the limitation of their own CO2 emissions are inconsequential. The IPCC acknowledges that the diminution effect with increasing CO2 concentrations exists, but it does not explain its consequences. Like the Medieval Warm Period that the IPCC attempted to eliminate with the hockey stick graph in 2001, the IPCC knows that wide public knowledge of the diminution effect with increasing CO2 concentration would be entirely detrimental to their primary message. It is increasingly clear that policymakers and global warming advocates have long been headed down the wrong path. On the other hand, a cooling world as both Hemispheres have seen in the years since the turn of the millennium leads to much more dire consequences for the biosphere and mankind, than any realistic amount of warming that could arise from man-made CO2 emissions. The damage can be seen from the current 2014 winter weather in North America, Asia and Siberia and the significant cooling winters across Europe up to 2013. Cold is a much greater threat than any moderate amount of additional warmth that would ever result from the release of Man-made CO2. National policy makers and the United Nations are neither recognizing nor are they preparing for a cooling eventuality. With a quietening sun, changing ocean circulation patterns and the growing evidence of much colder winter weather in both Hemispheres, that cooling could already be upon us [xvi]. The cooling climate could well last for many decades or even centuries. Note: Footnotes are interrupted because the text was shortened. Excellent article. I wish that every elected MP/senator/representative, national or local, worldwide could read this. Carbon dioxide has a net cooling effect of about 0.1 degree: it cannot warm. Just remember there’s going to be a genuine $5,000 reward for the first to come up with proof I’m wrong and proof IPCC are right about water vapour – see last paragraph.. In a horizontal plane you can observe diffusion of kinetic energy in your home. Just run a heater on one side of a room, turn it off or even remove it quickly from the room, and you will temporarily have measureably warmer air on one side of the room. Molecules then keep on colliding and as they do, kinetic energy is shared. Statistical mechanics tells us that temperature (that is, mean kinetic energy per molecule) will even out across the room assuming it’s well insulated. Suppose now that the room has double glazed windows and it’s cooler outside. Which is more effective at insulating the room? (c) A window full of carbon dioxide only, like the Venus atmosphere? Why then does the thermal gradient reduce in magnitude because of the inter-molecular radiation between carbon dioxide molecules in the Venus atmosphere, or between a few methane molecules in the Uranus troposphere or between water vapour molecules in Earth’s troposphere and Earth’s outer 9Km of its crust? All these thermal gradients (aka lapse rates) are less steep than they would have been in dry air or (nearly) non-radiating gases. Gravity would have induced a steeper -g/Cp gradient. The thermal gradient in the Uranus troposphere does not level out (despite no solar radiation or any surface) because to do so would violate the Second Law of Thermodynamics. It seems most of you don’t understand why, but the reason is that entropy would decrease. If somehow a state were to evolve with more gravitational potential energy per molecule at the top, but no compensating reduction in kinetic energy per molecule (ie temperature) then there would be unbalanced energy potentials at the top, so work could be done and thus entropy would not have been at a maximum. The four molecule experiment demonstrates this and how it happens at the molecular level. The Ranque-Hilsch vortex tube demonstrates it, and kinetic energy is re-distributed such that the inner tube gets far colder than the air that was pumped in. So you can’t blame friction for heating the outer tube. Nor does pressure alter temperature, because pressure is proportional to the product of temperature and density: temperature is an independent variable and only varies when mean kinetic energy per molecule varies. Finally, none of you can explain how the Venus surface actually rises in temperature from 732K to 737K during its four-month-long day, unless you start by understanding that the thermal gradient is the state of thermodynamic equilibrium. Then you need to understand the mechanism of “heat creep” explained in the second part of the four molecule experiment. There will be a $5,000 reward for the first to prove me wrong with conditions explained in public advertisements and on all of a dozen or so of my websites. To win the award you will also have to show empirical evidence of the IPCC postulate that the sensitivity to water vapour is of the order of 10 degrees of warming for every 1% increase in the Earth’s troposphere. Decarbonizing does nothing, and the answer to the question of what is the ideal temperature? 3° warmer than it is now. I don’t have ANY doubt that a LOT of people from “the north” (aka….Yankees) move down to the south. They have been doing this for DECADES. Southern Cal, Phoenix, Las Vegas, Florida. Those people in the north HATE snow after 50 – 60 years of it (and I don’t balme them:). Having lived in Texas for a while…I LOVED IT. Ft Worth WAS one of he best cities in the country to live in (pre fracking…….about 10 years ago). Now…..you couldn’t pay me enough to move down there. Too much pollution…..and too little water. Stupid Buffy. All panicked about Global Warming. Yet he knows himself that even if it happened all we would need to do is move 100 miles to the North. Actually, it will be Alamogordo, NM, as soon as we can. Great! Let’s all go back to the stone ages so that we won’t have to worry about genetic defects anymore! PG, you can delete the comment above (insane) as it refers to Buddy’s comment that you have snipped. When the Chinese install flue gas scrubbing, that’ll drive up the price of solar panels in the West, as the electricity they are made with will become more expensive. Buffy and his demand for cheap solar panels kills children in China. You link says “May’. Now here’s something for you. It concerns a large toxic lake in China which is the result of mining for rare earth metals used to make wind turbines. People really are falling very sick and dying. So much for your clean energy Buddy.